A Phone Case That Can Print Selfies? Yes Please! French startup company Prynt has created every millennial's dream: a phone case that can immediately print selfies (and fine, ~*groufies*~ and ~*shofies*~ and whatever ~*-fies*~). 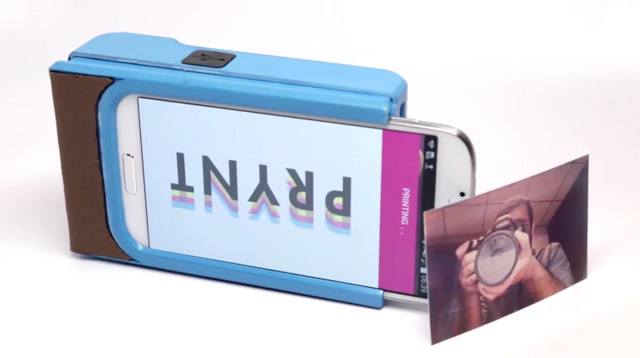 The phone case—which goes by the same name as the company—will instantly transform your smartphone into a Polaroid camera. You simply have to attach the case and print all the wallet-sized photos you like. Right now, the case can hold 10 pieces of photo paper (that the company manufactures) at a time, while the battery pack can last for up to 30 printed photos. The company is also developing an "augmented reality" feature of the app, which according to the DailyMailUK means: "When a photo is taken using Prynt, the app records seconds either side to capture a video. Holding up the photo to the phone’s camera, with the app open, plays the video on the screen." Prynt will launch on Kickstarter in January 2015 at $99 each (that's about 5,000 pesos!). What do you think, CGs? Would you get this case? Find out more about the company and the product here!